areas, then on to the Laguna Mountains in the distance. past decade on Palomar Mountain. 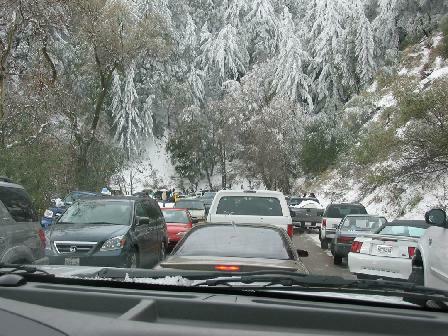 "Gridlock on the East Grade"
Our beautiful snow drew the tourists to Palomar like a magnet on Sunday, March 12, 2006. Photo taken through the windshield at about the 6 mile marker by Don Heller's son, Austin. Next time, the CHP promises to require chains.